A former student of mine, who became a close friend, had these words posted above her desk: " Apply the seat of your pants to the seat of your chair." If I remember right, it was a small sign, not much bigger than an index card. "I need a copy of that," I said. It seemed the truest advice I'd ever seen about the writing practice. The most straightforward and without fanfare. You need to write something? Sit thou down in the chair and do it and don't get up till it's done. I envision a chair with seat belts and straps, on a timer system. I'm there, lashed in, and I won't be able to get out of the straps until the buzzer goes off in two hours. When the next holiday rolled around -- maybe Christmas or Valentine's -- this writer friend gave me a package to open. It was the "Apply the Seat..." saying, framed, 8 x 10, in a font that was large and bold and RED. I loved it. I put it on my desk, just to the right of the computer where I would see it each time I sat there itching to get up and do something else. 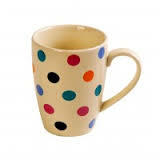 On her next birthday, she got from me a lucky coffee cup with multi-colored polka dots on it. I'd already given her a lucky coaster on which to place the lucky coffee cup. 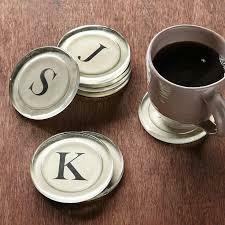 The coasters were in the Sundance catalog and looked like old-fashioned typewriter keys, the capital letter under glass. I bought up a half-dozen or so for gifts to students and writer friends. I would tell them: Put your hot beverage on this coaster each day as you start to write and it will bring you luck! The importance of these rituals, and observances of objects as lucky, as somehow pleasing to the muse, is that they give us something concrete on which to focus. And they give us hope. And they give us, sometimes, lots of excuses for getting up and down out of the seat of the chair to which we've applied the seats of our pants. 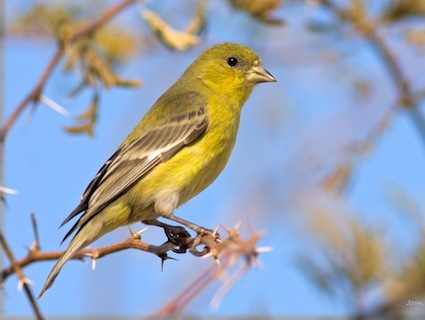 Case in point: I have this theory that the cluster of Lesser Goldfinches on the finch feeders on a tree by the deck at our house just might be my collective muse. Via a long white tubular mesh sock thing, I feed them Nyger seed; via their smallness and their sunny yellow undersides, they feed me joy and luck. There are two of these sock-type feeders on the tree branches that touch our deck railing. Sometimes, as many as a dozen birds occupy a single long feeder, but any time of day, there are at least two of these bright-breasted birds eating their Nyger in the view from my study window. If I apply my seat to the seat one morning, and I look up, and the finch feeder is busy, with a waiting list, I am happy about that. 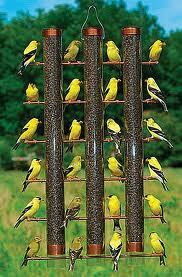 I watch the finches for a bit, and they put me in a good mood for facing the writing project, whatever it is. If however, I look up and the two finch feeder sacks are just hanging there, slack, no seed left in them, I feel dismayed and remiss. Easy enough to fix it, usually, because there's a big crate full of seed in the backyard. But sometimes it might mean a trip to Jay's Bird Barn for the purchase of a new 25 lb. bag. If I don't go buy the seed and fill the flaccid sacks, right then, will that day's writing time be a failure? Of course not. There are going to be good and bad days, regardless. But it's simple enough to feed the birds, and pleasant. 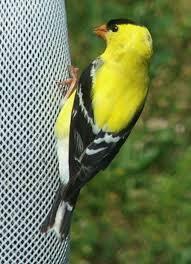 If the Lesser Goldfinch is my muse, we must keep her coming back. And if she isn't, what harm has been done in offering up the seed? We've all heard the stories about the eccentric rituals of famous writers. 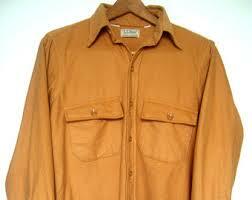 John Cheever wrote in his boxers. Someone else could not begin a writing session without two sticks of a certain kind of gum lined up parallel or perpendicular to the computer keyboard. Maybe you have to be looking out a certain window, wearing some lucky pj pants, with the cat curled up at your feet, before the writing can commence. Much of the time I was writing the first draft of a memoir about my father's illness and death, I had on his shirt -- a well-worn, corn-colored, canvas button-down from L.L. Bean. Whether the writing went well or poorly on a given day, I was comforted by cloaking myself in something that had cloaked him. But really, honest to God? Just sit in the chair and face the blank pad or blank screen and no matter which strategy you employ or which superstition you invoke, or what voodoo you've performed prior to sitting there, the Lesser Goldfinches fed or frantic, the stuff around you assembled just so, lucky shirt or pants, etc., it's rarely going to be easy. This is why we court, coerce, cajole ourselves into doing the work. Whatever methods we use to dupe, bribe, or shoe-horn the seat of our pants into the seat of our chairs, the process of writing itself will be difficult. Count on it. You're taking nothing, some air, some blank space on a page or a screen, and turning it into something -- shazzam -- with flavor and texture and emotion. Something that never existed before that moment right then. It's important work. Get to it any way you can.